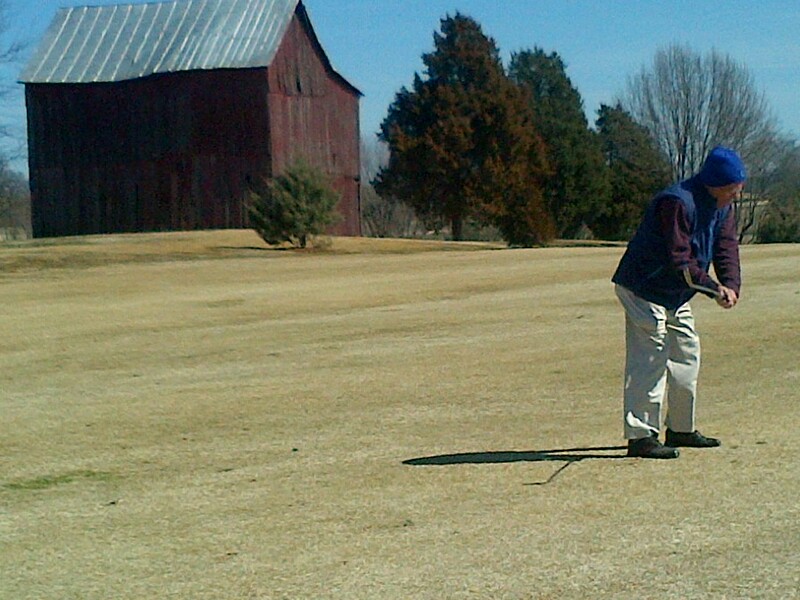 FRANKLIN, Ky. – Squeezing in a fast nine holes is a good way to break up a long driving trip. It doesn’t cut severely into the mileage covered and certainly is refreshing. On our last winter trip we indulged in that practice twice – and with goals in mind. 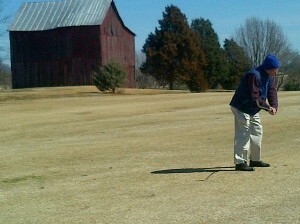 We’d never played golf in Tennessee or Kentucky. Now we have. 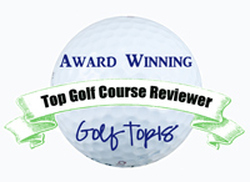 In both cases we checked out courses in the southern-most part of those states. Hillcrest Country Club is a private nine-holer in Pulaski, Tenn., just over the Alabama border but about 15 miles off Interstate 65. While it’s a private facility, with a nice dining room and tennis courts, its members told me that golfers from out of the area are welcome. That’s apparently how we got on the course on a nice Sunday afternoon in February with temperatures in the high-50s – and for fees of $15 and with a cart, no less. Winter tees were in use and much of the grass was dormant. Still, it was golf and Hillcrest’s members were proud of what they have. They enjoyed not only the course but the big driving range as well. While Hillcrest was a long way from the courses we enjoy in season in Illinois or in the winter in Florida, it was still fun, challenging and well worth the stop. 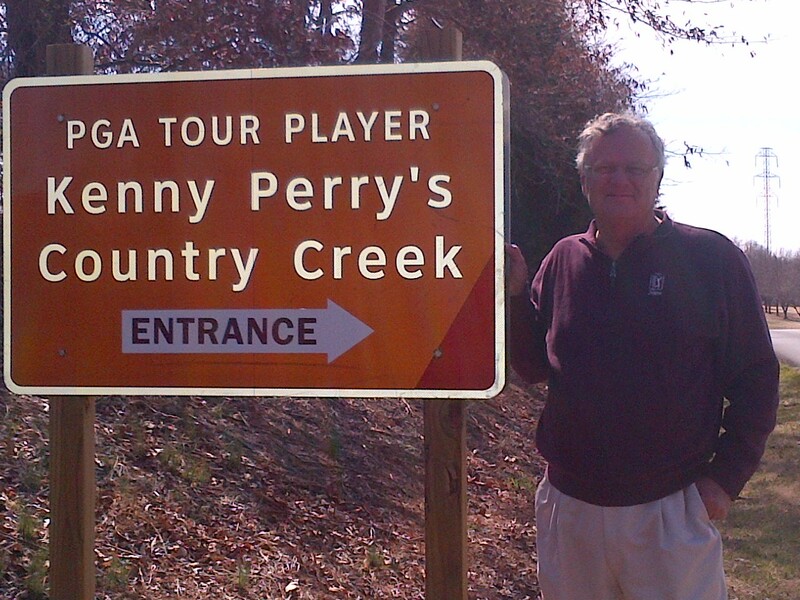 Even more so – on all counts – was Kenny Perry’s Country Creek, the site for our Kentucky golf debut. It’s a few miles over the Tennessee line and about 35 miles from Nashville, Tenn.
Perry, a solid PGA Tour player now competing mainly on the Champions Tour, grew up in Franklin, went to college at Western Kentucky in nearby Bowling Green and feels so strongly about his home state that he took extraordinary steps to qualify for the U.S. Ryder Cup team in 2008, when the matches against the Europeans were played at Valhalla in Louisville. That year Perry caught flak for skipping the Masters, U.S. Open and British Open because he thought he could pile up more Ryder Cup points playing a different schedule. As it turned out, he was right. He earned a spot on the U.S. team and helped the Americans win for the first time since 1999. It was long before that, though, when Perry decided to create an 18-hole course for his fellow residents of Franklin. The course, which can been seen off Interstate 65, opened in 1995. Its mailing address is 1075 Kenny Perry Drive and the compact pro shop/ clubhouse is filled with his memorabilia. Perry’s daughter Lesslye came up with the Country Creek name, and Perry has called the course “a dream come true.’’ The layout includes some barns (shown below) left from the days before the land was a golf course. 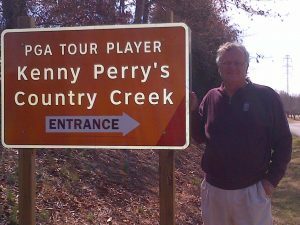 Though Perry isn’t one of the many tour players who have dabbled regularly in course architecture, he did design Country Creek. I became interested in visiting the place after being one of Perry’s partners in the first pro-am of the 2007 BMW Championship, the FedEx Cup playoff event then played at Cog Hill. That was one of my most memorable days covering golf. 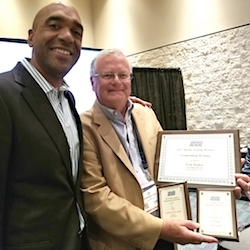 It started with a one-on-one interview with PGA Tour commissioner Tim Finchem in the morning, then the afternoon round with Perry that included me sinking a 50-foot birdie putt. The pro-am round was rained out after 10 holes but Perry, pleasant on the course, was even nicer during the rain delay – a true class act. Anyway, I had covered Perry’s bid for the 1996 PGA Championship at Valhalla, when he lost the title to Mark Brooks in a playoff and, of course, followed his unusual game plan to play in the Ryder Cup. Part of it included winning John Deere Classic, another event that I covered up close and personal. Business obligations took me to Nashville several times a year for awhile, and I stopped by Country Creek for a few minutes on one occasion just to see what Country Creek looked like. It was too cold for anybody to play that day, but not on this most recent trip. 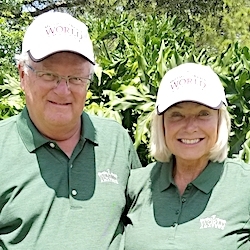 Players were lined up to tee off on this chilly but sunny Monday in February, and the $13 greens fee (for seniors with cart for nine holes) might have been part of the enticement. Maybe Perry should take another stab at course design. His first venture in his hometown has been well received, especially by the locals. They find it especially beautiful in the spring when the flowering is in bloom, but even in the winter the greens were in good shape. Country Creek, which measures 6,633 yards from the tips, is on the short side for championship play but each hole was a fun challenge – especially the par-3 eighth over water. A steep hill fronts the green, and you’d better hit it all the way to the putting surface (a carry of 119, 137 or 199 yards, depending on the tee you choose) or your ball will roll back down the hill and into the drink. Mine came close to doing that. Closing in on its second decade, Country Creek is a worthy contribution by Perry to his home town, and its worth a look by occasional visitors as well.